All Assam Students’ Union (AASU), Dhemaji district unit on Monday staged black protest against the Citizenship (Amendment) Bill, 2016 and demanded the State and Central Governments for its scrapping without further delay. 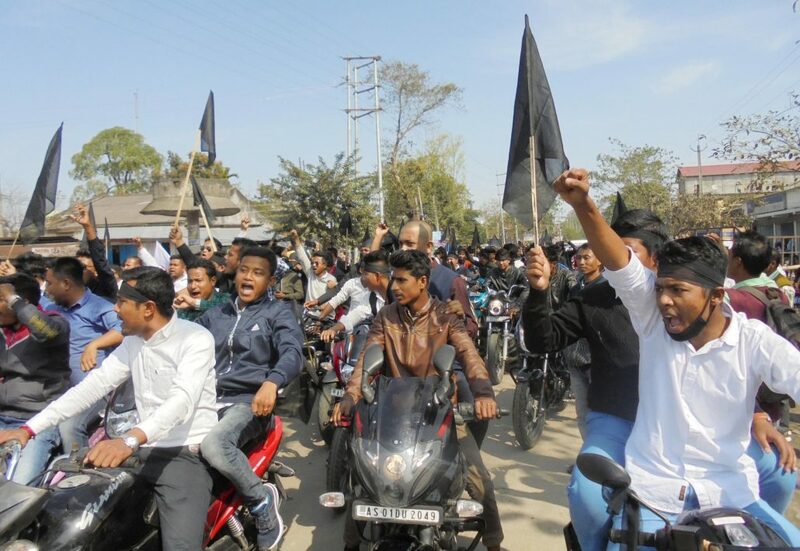 Several hundred AASU activists including some central committee executives and district committee functionaries took out bike rally bearing black flags along Dhemaji town roads, shouted slogans against the BJP led government in the Centre and in Assam. They staged the protest on chief minister Sarbananda Sonowal’s arrival at Dhemaji to launch Chief Minister Farm Tool Scheme in a public meeting. The protesters shouted slogans for immediate scrapping of controversial citizenship bill and warned the chief minister not to play cats and mouse game with the sentiment of indigenous Assamese people. They also warned the government that forceful enforcement of the bill would create untoward situation in the State and the State Government would solely be responsible for it. The AASU activists earlier in the morning staged protest-in-demo at Dhemaji Shwahid Nyash (near Thana Tinali) and shouted slogan against the BJP led State and Central Governments waving black flags. Talking to media persons during the protest rally, AASU leaders have said the controversial citizenship bill meant to grant citizenship to Hindu foreigners in Assam would adversely affect the language and cultures of indigenous Assamese besides destroying unity and integrity of greater Assamese society. “We have taken rigid decision to continue our protest against the government until the destructive bill is scrapped. The indigenous Assamese people will never tolerate forceful enforcement of such bill to destroy unity and peaceful existence,” said Chittaranjan Basumatary, vice president of AASU. The AASU in association of 28 ethnic organizations has been staging a series of protest move including dharna, torch-light procession, bike rally. They earlier staged ‘Warning Demo’ at all district headquarters of Assam protesting the citizenship bill.